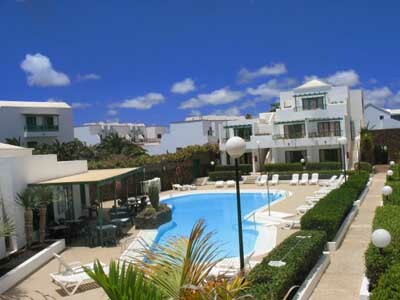 Address: Tabaibas, 10, Costa Teguise (Lanzarote), Islas Canarias. The Guarapo Apartments are situated only 200 metres from Playa Bastian, and 300 metres from the centre of Costa Teguise, on the beautiful, volcanic island of Lanzarote. Set around a central swimming pool area, the Apartamentos Guarapo are ideal accommodation for a relaxing and sun-filled holiday. From here you can also take a walk to the nearby sandy beach. You can then stroll along the seafront promenade, or go for a bike ride. Guarapo has well-equipped apartments, with kitchens where you can prepare your own meals, and a living room – ideal for unwinding in the evening. Please inform Apartamentos El Guarapo in advance of your expected arrival time. You can use the Special Requests box when booking, or contact the property directly with the contact details provided in your confirmation. This property will not accommodate hen, stag or similar parties. When booking more than 2 rooms, different policies and additional supplements may apply.